Bielefeld, Sept. 8/2015: Recognition Award for Special Aerial Robot: The project “Defikopter” from HEIGHT TECH and non-profit organization definetz eV received a prize for best innovation at the Human Telematics Award 2015. The prize was awarded on Sept. 7 at the IFA in Berlin. 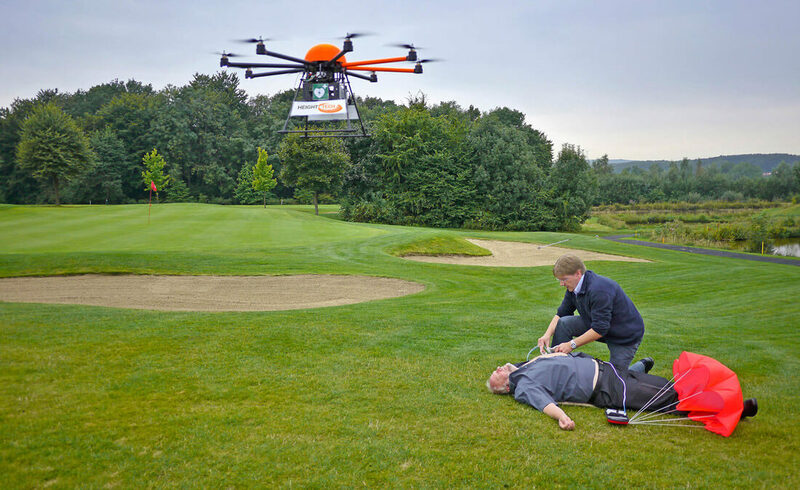 The “Defikopter” is the life saver of the future: The aerial robot flies at a speed of 70 km per hour, and while GPS controlled can throw off a defibrillator from the air. Thus, quick help can arrive when seconds matter, such as in a cardiac arrest. The Deficopter will be useful for areas outside cities, where the supply of defibrillators is insufficient and paramedics take a long time to get to the sites. The “Defikopter” covers a radius of several kilometers and can operate in nearly all weather conditions. The aircraft operates via a special app: Using this app, the companion of the person with the heart condition informs the emergency call center. Simultaneously, the emergency call is directed to the control center of flight robots and immediately a “Defikopter” is launched. This ingenuity convinced the jury of the Human Telematics Awards Team.